Surrounded by journalists and Hamas officials, former President Jimmy Carter, center, stands in front of a building destroyed during Israel’s offensive in Gaza earlier this year, as he visits Jebaliya, northern Gaza Strip, Tuesday. Photo by Khalil Hamra / AP. Jimmy Carter was never one of the great American presidents, and he made a number of errors during his one term (1977-1981), but we have long maintained that he is the best ex-presidents our country has ever had. He reaffirmed that characterization yesterday (June 16) on a visit to Gaza where he made some stunning comments about the plight of the Palestinian people, and had a meeting with Prime Minister Ismail Haniya of Gaza, who is not recognized by the U.S. or Israel. The Hamas leader expressed a favorable view of President Obama’s June 4 speech to the Muslim world in Cairo. “We saw a new tone, a new language and a new spirit in the official U.S. rhetoric,” he said. Carter, who calls for an end to all violence between Israelis and Palestinians, toured the ruins of Gaza, which remains a shambles months after Israel’s December-January invasion of the Palestinian enclave because of Israel’s blockade. The latest war resulted in the death of 1,400 Palestinian residents — largely civilians, including many children. Israel suffered 14 dead, mainly soldiers, some by friendly fire. 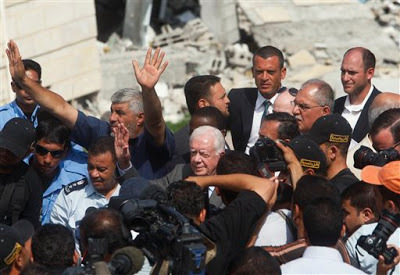 At the debris that remained of the American School, another Israeli target, the former president said “I have to hold back tears when I see the deliberate destruction that has been wreaked against your people.” Noting that the school was “deliberately destroyed by bombs from F-16s made in my country,” Carter said “I feel partially responsible for this as must all Americans and Israelis. Last month in Damascus [Carter] met Khaled Meshal, the head of the Hamas political bureau and the group’s effective leader. Carter has been meeting Israeli officials and travelled to a Jewish settlement on the West Bank at the weekend as part of his private diplomatic efforts. His visits are not always welcomed by the Israeli government, which has been angered by his meetings in recent years with Hamas. On Sunday Carter criticised a policy speech given by Netanyahu, in which the Israeli prime minister, responding to weeks of pressure from ­Washington, gave carefully worded approval for a future Palestinian state under strict ­conditions, but insisted “normal lives” should continue in Jewish settlements in east Jerusalem and the West Bank. “My opinion is he raised many new obstacles to peace that had not existed under previous prime ministers,” Carter said during a visit to the Knesset in ­Jerusalem. But Carter said he had encountered even greater differences with the former Israeli prime minister, Menachem Begin, and had still managed to broker a peace deal between Israel and Egypt. . . This entry was posted in RagBlog and tagged Gaza, Hamas, Jimmy Carter, Palestinian Occupation. Bookmark the permalink. Even if Jimmy’s rhetoric is sometimes more inflammatory than informative, I give the man credit for putting his actions and his money where his mouth is. JImmy Carter made a number of errors as President?? Compared to who that never made an error?? He “gave away” the Panama Canal, began energy conservation and solar for homes and business, determined that our foreign policy should be based on human rights, etc. The “left” opposed him on making the gas tax a percentage, so that when gas went up, the government would get money for roads and trains. The left believed at the time that cheap gas was good for everybody. Carter wasn’t mistaken, but a big ahead of his times.If we had continued his policies, we would be in far better shape today.